The BIG Buddy Talker! Add Speech To Your Arduino Projects! This listing is for a fully assembled BIG buddy talker modules. Basic shipping within Canada and the US is included in the $43 price tag. When you purchase this set, you will receive one fully assembled and tested BBT module, one stereo cable, and a bunch of female-to-male cable connections. It is compatible with Arduino and Raspberry PI. This module came to fruition through a very successful Kickstarter campaign. There is a 1000+ word library, which can be found below, a fan/backer produced Arduino Library for simple usage, and tons of reference videos below. There are even some basic Arduino code samples below. Lastly, you can see the complete video manual below. If you have any questions, please feel free to contact us through our CONTACT US page. Thank you for taking an interest in the BIG buddy talker! Thanks for taking an interest in the BIG BUDDY TALKER. Below is all of the relative documentation associated with the BBT. 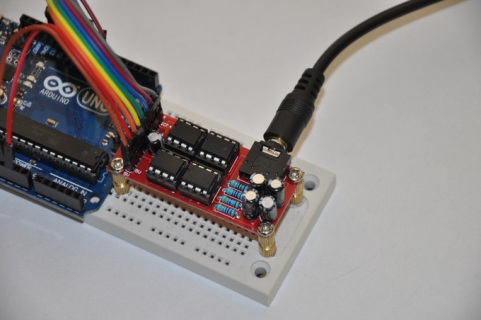 Code samples are below, and the Arduino Library written by LeRoy Miller has been added.